Fact: they who control the U.N. and they who control the White House control the world. That is one reason why Barack HUSSEIN Obama does not want to stop ISIS. Obama is aware that while ISIS can build the caliphate by force ISIS lacks the capability to manage the affairs of a dictatorship, and know that the caliphate is but a dictatorship in disguise...just as islam is a political system in the guise of a religion. 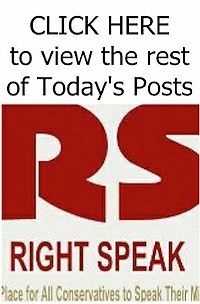 A brutal and barbaric dictatorship such as the caliphate would have no interest in seeking recognition or legitimacy from the United Nations nor from any of its members, however, control of the United Nations and one of its most influential and powerful members would indeed fit their agenda. Enter center stage Barack HUSSEIN Obama and the United States of America which, we believe, his intention is to make the 58th islamic state. And how would he do this...know that when this, his last term as president is up, Barack HUSSEIN Obama will NOT 'fade away' as some presidents do for his entire presidency has been orchestrated as a stepping stone to bigger things...to bigger things involving the one-world government of the caliphate. And he intends, we believe, to do this by using the U.N. to reach that goal. 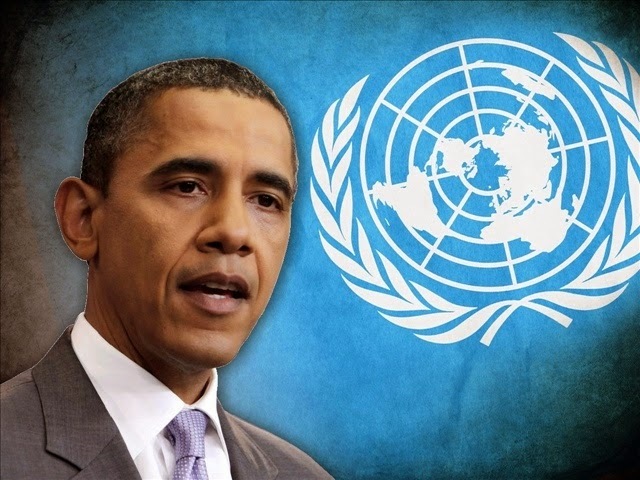 But to use the U.N. Obama needs someone by his side who can craft deals, manipulate heads of state, and who can lie and cheat with abandon, and who can cavalierly throw aside those who get in the way of the ultimate goal. 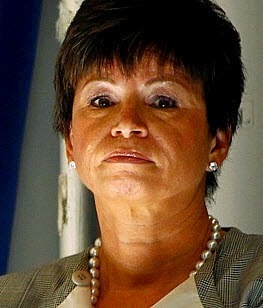 And one person alone comes to mind...Obama's puppet master...Iranian born, Muslim Brotherhood supporter, and Iranian.com’s 'person of the day'...Valerie Jarrett. Valerie Jarrett...the woman who has been at Obama's side since his Chicago days as a Community Organizer...the woman who sits in on National Security Council, economic, budget, and foreign policy meetings...the woman who routinely meets with muslim and Arab-American advocates and leaders behind closed doors at the White House and discusses internal policy, health care legislation, foreign policy, the economy, immigration, and national security with them...the woman who advises Obama about how to decide policy...that woman will be with Obama as he works his way into a top U.N. position and once there Jarrett will again pull his strings this time to assure the caliphate not only is in place but to assure its spread throughout the world. Also, remember that it was Valerie Jarrett who Obama sent to Bahrain to hold secret talks with representatives of Ayatollah Ali Khamenei's government for a year before the formal Iranian nuclear disarmament negotiations in Geneva even began. As aligned with ISIS and islam as is Obama...maybe even more so...Valerie Jarrett is the reason why ISIS has not yet committed its atrocities here on American soil nor will they, we believe, until a new Republican president is in office. 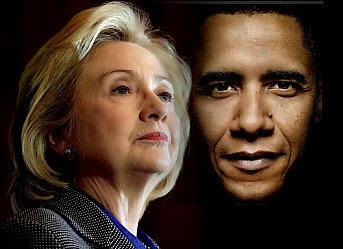 ISIS needs these two...needs Jarrett to manipulate Obama to do their bidding...to help them work their way into the U.N. via the office of the U.S. presidency. 2016 will be the deciding factor as to whether ISIS comes to America or not...and why...because if Hillary does become president she would have the protection of Huma Abedin the same way that Valerie Jarrett protects Obama. Remember, Abedin is directly connected to the Muslim Brotherhood through her mother, a member of the Muslim Sisterhood which is a branch of the Muslim Brotherhood, and thus can be controlled to do islam's bidding through that connection. Not only would Hillary be protected through Abedin but both would, we believe, be assured a position in the caliphate through that very connection. And while islam usually does not have women hold positions of power they would do so in this case because these women would be puppets of those actually pulling the strings...pulling the stings and controlling America in the process. Huma Abedin who, while working as Hillary Clinton’s confidant of sorts also held a side job, as former federal prosecutor Andrew McCarthy stated, “Abedin worked for many years at a journal that promotes Islamic supremacist ideology that was founded by a top al-Qaida financier, Abdullah Omar Naseef,” holding that position from 1996 through 2003. The journal of jihad Abedin worked for...'Journal of Muslim Minority Affairs'...was originally edited by Sayed Abedin, Huma Abedin’s father and is now edited by Saleha Abedin...Huma Abedin’s mother who is also deeply connected to an organization called the 'Islamic Committee for Woman and Child.' This committee is headed up by Sheikh Yusef al-Qaradaw...a well known Muslim Brotherhood jurist who routinely issues fatwas calling for the murders of American military and American private contractor personnel along with advocating homicide bombings inside Israel. It is not difficult to connect the dots and understand why Huma Abedin, with her islamic and Muslim Brotherhood connections, along with her intimate knowledge of Hillary Clinton’s and the United States policy agenda, would play a key role in controlling the White House in a Hillary Clinton presidency just as Valerie Jarrett has during the Obama presidency. We believe this was a pre-ordained statement in that, should he be elected president, and with Valerie Jarrett being his islamic puppet master, islam would maintain a hands-off policy when it came to jihad on American soil. 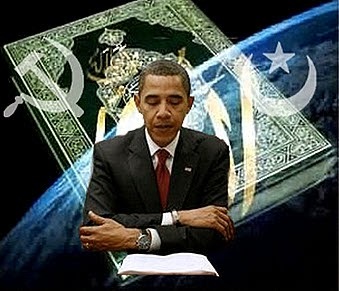 As long as Obama danced to the islamic music via the pipeline of Jarrett, America would remain safe as it were. We also believe this to be the case should Hillary Clinton win the presidency in 2016 via the Huma Abedin pipeline in as much as should Hillary, like Obama, dance when her puppet strings are pulled by islam, jihad would remain over there rather than coming over here. Now consider this...should Obama move on to a plum job or position within the United Nations, and knowing that Jarrett would come along with him to continue to pull his strings at the whim of islam, and should Hillary Clinton become the 45th president with Huma Abedin at her side, islam will pull her strings as well...and the caliphate as built by the savage and barbaric tactics of ISIS, and managed as a dictatorship by the Muslim Brotherhood, would hold positions of immense power controlling policy as set by both the United Nations and the White House...a dire proposition to be sure. And remember, Valerie Jarrett, the woman who when addressing students at Stanford University in 1977 said, "I am an Iranian by birth and of my Islamic faith. I am also an American Citizen and I seek to help change America to be a more Islamic country. My faith guides me and I feel like it is going well in the transition of using freedom of religion in America against itself" proved all those many years ago to be aligned against America. 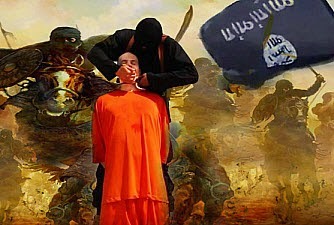 The long and short of this scenario is as follows...as long as any American president remains pro-islam while turning their backs on our allies this assures the caliphate will be built... swallowing up and/or destroying afore mentioned allies in the Middle East, and allowing for the possibility of the caliphate having nuclear weapons at their disposal. Thus, Americans will remain safe from the horrors of islam on our own soil. But should we elect a Republican president in 2016, one who is willing to go to war to protect our interests and allies in that region, all bets are off and the next 9/11 will be launched against the United States post-haste. The linchpins in all of this are Abedin and Jarrett but why would islam, well known for relegating females to a position of nothing more than chattel invest so much power in these two women? 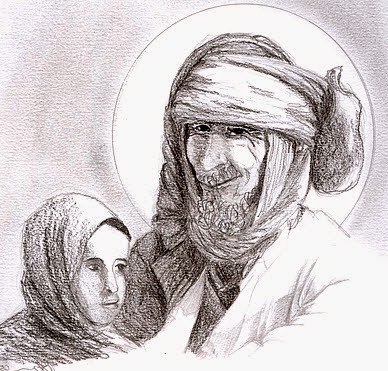 To connect those dots, we must step back and examine the relationship that started it all in the muslim world...Muhammad and his child bride Aisha. Valerie Jarrett's relationship to Obama can be compared to Aisha's relationship to Muhammad not in a husband and wife sense but comparing each as the Svengali to the other. Aisha played a critical role in the emergence of islam including in its evolution of social reform. Not only was she supportive of Muhammad, but she contributed to the development of islam itself. Given the title 'al-Siddiqah,' meaning 'the one who affirms the truth' Aisha was known for her knowledge of the qur'an and Arab history. In fact, her contributions regarding the verbal texts of islam were transcribed into written form and became the 'official' history of islam. After Muhammad's death, Aisha was regarded by many as the most reliable source in the teachings of the hadith as she was often looked upon to settle disputes on 'demeanor' and various points of law. In other words, just like Valerie Jarrett, Aisha was a policymaker. As for Valerie Jarrett's relationship with Obama, like Aisha, Jarrett continues to play a critical role in shaping both Obama's foreign and domestic policies. Working not only for social change, just like Aisha, Jarrett has actually dictated to Obama what his policies on immigration and health care would be as well as directing him to give positions of power within our government to Muslim Brotherhood operatives, earning her the nickname of 'puppet master' and 'the woman who runs the White House.' And while Obama pretends to be his own man it is Valerie Jarrett who set's up his schedules, decides who he is to meet with or not meet with, and who for all intents and purposes never leaves his side. As for Hillary Clinton's relationship to Huma Abedin, their ties are personal as well as political but it's the political that is of concern, because the Muslim Brotherhood's influence as passed along through Huma Abedin can clearly be seen in U.S. foreign policy decisions made by Hillary in her capacity as Secretary of State. Remember, Hillary was the woman who allowed the enemy...the 17th February Brigade...an offshoot of Ansar al-Sharia...to guard our Benghazi Compound and who recently said that we must show more empathy for the enemy. Hillary, also know as an apologist just like her boss Obama, apologized directly to the Muslim Brotherhood for the YouTube video she and the administration tried to claim was the catalyst for the Benghazi attacks. And let's never forget her infamous words, “what difference does it make” in regards to the deaths...to the murders...of U.S. Ambassador Christopher Stevens, Sean Smith, Glen Doherty, and Tyrone Woods. But as critical as the Obama/Jarrett and Clinton/Abedin connections are even more so is the fact that islam's modern-day Aisha-policymakers...both of whom know their bosses deepest personal and political secrets...are poised to assume power positions within both the United Nations and the White House even as Hamas and Hezbolla begin to coalesce into a united front of islamic power in the Middle East. With the relationship between Hezbollah and Hamas most definitely warming up based upon their mutual hatred of Israel and despite their differences over Syria, both remain united in their goal of seeing Israel fall and being replaced by the Palestinian Authority which is loyal to Hamas. Both Hezbollah and Hamas are puppet elements of two bigger dots that need to be connected...the first being that Hamas is the Muslim Brotherhood...the second being that Hezbollah is Iran. And once these two factions permanently unite...and that time is fast approaching... Israel will face major problems as will their new ally Egypt...an Arab country who has outwardly set themselves against the islamists...who will now face both factions as they actively work to remove Egyptian President el-Sisi from office in retaliation for his overthrow of the Muslim Brotherhood's puppet President Mohamed Morsi. An even more dire element to this part of the picture is Obama's insistence in cutting a deal with Iran...a deal that will allow Iran to build nuclear weapons. An integral component of the big picture is the Muslim Brotherhood, more palatable to the Arab nations yet islamists in their own right. 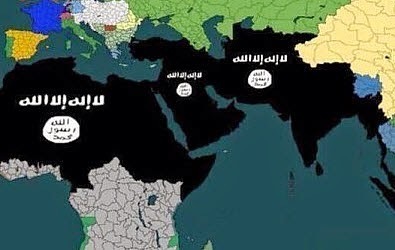 Once the army of ISIS has the caliphate in place circumstances will afford the Muslim Brotherhood the opportunity to become the defacto dictatorship of the caliphate. Remember, the Muslim Brotherhood is a well organized political entity whose presence in the Middle East has been in place for almost a century leaving them the logical choice for running 'the business' of the caliphate, while ISIS would become to the caliphate what the Gestapo was to the Third Reich. Connect the dots...once the vacuum of power is created by the fall of Egypt and the islamic hoped-for destruction of Israel...and once the Muslim Brotherhood is outwardly allied with Iran...and once Iran is under the protection of an Obama engineered deal...a deal as with 'his pen and his phone' rather than a treaty which would require Senate confirmation...the defacto dictatorship of the caliphate would then be in possession of nuclear weapons. Let us be crystal clear on this point...we believe that the ultimate goal is not just to allow Iran to have nuclear weapons capability, but to make nuclear weapons accessible to the whole of the caliphate with delivery systems that could not only threaten the Middle East and our allies, but delivery systems that could reach Europe, the UK, and even the United States. After connecting the individual dots to see the total picture as to where this current regime and a possible Hillary Clinton regime would take us regarding the caliphate, our allies in the Middle East, and America's future both on the world stage and here at home, it becomes apparent that the only way to stop what is now shaping up as a destiny none can afford is to elect a Republican president who would employ military might against the forces of barbaric islamic savagery...against Obama's brethren.